Average Weight	: 8 - 14 lbs. In the late 1600s this breed was developed in the British Isles, Asian spaniels were interbred with Pugs, which resulted in a smaller dog with flatter noses, upturned faces, rounded heads and protruding eyes. The breed was originally developed as a woodcock dog. However, they quickly became a favorite of British royalty, and soon became primarily used as companion dogs. In fact, the term King Charles Spaniel came from King Charles II of England, who owned several of these dogs. This breed is still a favorite pet in England. Breeding programs began in the nineteenth century to breed the dogs down and give them a flatter and more upturned face. Their eyes were also bred to be more protruding, leading to the breed as it is today. These breeding programs are also thought to be how the Cavalier King Charles Spaniel came about....a favorite of British Royalty. 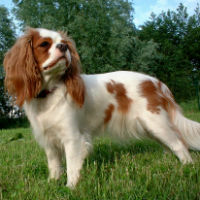 History of the English Toy Spaniel as Published by: "The Camino Real English Toy Spaniel Club"
The true origin of the King Charles English Toy Spaniel is lost in obscurity. The first written reference to the breed in England was 1570 and it looked very different with the muzzle pointed. It was during the reign of the two Charles's from 1625 to 1685 that the spaniel came into prominence. Charles II gave his name to his beloved toy spaniels; indeed the poor man seemed to be in constant trouble "for playing with his dogs all the while..." King James II, Charles' brother, obviously got his priorities right -- when shipwrecked off the Scottish coast in 1613 and compelled to abandon ship James ordered the crew: "Save the dogs," and as an afterthought, "and Colonel Churchill." (This Churchill later became Duke of Marlborough.) By issuing a Royal Proclamation King Charles commanded that all Toy Spaniels be granted entry everywhere in the British Empire -- shoppes, cafes, pubs, offices, etc. This decree is still in force! Cross-breeding with the pug, Japanese chin and bull-dog allowed the development of the "apple" round head and flat face. Their small size and gentle loyal nature endeared these loving creatures to the English and French and allowed the breed to enjoy immense popularity during the Edwardian reign. The entire breed was almost lost in the Second World War being kept alive on a very small scale by one or two breeders -- it is from these lines that today's dogs have descended. Gaiety, sweetness of temper and undying devotion to their owners are the hall-marks of these enchanting little dogs. With their handsome appearance and lovable dispositions, this aristocratic little breed has charmed its way through history. By the early nineteenth century the breed had evolved;to the present-day King Charles as we know it. By natural selection the face was shortened over a period of time. All four colours were established: the King Charles (black & tan); the Ruby (rich chestnut red); the Blenheim (has a ground of pearly white with bright rich chestnut or ruby-red markings distributed in large patches) and the Prince Charles (tri-colour has tan with markings in black instead of red on a pearly white ground). The Royal Courts and Ducal houses all had their own strains of toy spaniels. The King Charles was one of the favourite subjects of the Victorian artists, and the sixteenth century Italian artists also used toy spaniels to embellish their work. In 1885 a small band of devotees got together to form the Toy Spaniel Club. A sqabble ensued over the official name of the club and an appeal was made by powerful friends to the King himself. His Majesty Edward VII let it be known to the Kennel Club that he wished the Toy Spaniel Club in future to be known by its historic name of the King Charles Spaniel Club. The Kennel Club naturally bowed to his royal wish and the name was officially adopted. English Toy Spaniels are very loving and sweet dogs. They can sometimes be timid, especially with strangers, but once they get to know someone they are happy, gentle and playful. They are very affectionate with their families, but typically have one person in the family that they prefer to all others. If mistreated or hurt, they will sometimes bite in their defense. However, as long as they are treated properly, they are not at all prone to aggression. Toy Spaniels are well behaved overall, but are sometimes willful. They are quiet, and don't do well in loud rowdy households, though they love being with people. They are good with children, so long as they know to be gentle, and they are good with other animals. They don't enjoy being alone for long periods of time, but they are fairly inactive overall, so just having you around is all they really require. This breed is best suited to a single person or a very small family, perhaps where the children are older. They make the perfect companion dog for an older person, since they don't require much exercise or space and since they're very easy to care for. Once your dominance is established, this breed is very eager to please. They will be happy to obey and be your best friend, as this dog is primarily bred to be a companion dog. Many English Toy Spaniels love learning to do little tricks to amuse their families. They will love little games of fetch and hide and seek in the house, particularly while they are young. Some English Toy Spaniels are prone to respiratory ailments, and like other Pug nosed dogs, they may wheeze, snore and have trouble breathing, especially in the heat. Their eyes and ears are prone to infections, and so must be cleaned regularly. Some are prone to slipped knees. In addition, English Toy Spaniels sometimes suffer from hereditary eye problems, like Glaucoma and Cataracts. They are occasionally shown to have retinal dysplasia, as well. English Toy Spaniels sometimes suffer from mitral valve heart disease, a life threatening heart abnormality. When dogs suffer from this disease, the mitral valve of the heart ages and shrinks, failing to completely close off the area on the left side of the heart between the two chambers as blood is pumped. This causes a portion of the blood backward into the left atrium with each heartbeat. The pressure of blood within a normally functioning heart is highest in the left ventricle, as it is required to move the blood throughout the entire body. When blood flows backwards into the atrium, it elevates the blood pressure in that chamber and even further back into the lung field. English Toy Spaniels also sometimes have trouble with their teeth, particularly as they age. It's important with this breed that you brush their teeth regularly at home and that they have veterinary care for their teeth, as well. English Toy Spaniels are simple to groom, particularly for a long haired dog. This is a very sedentary dog. They need very little exercise and are known to be quite inactive. An occasional short walk is all the exercise they'll need. If you're a regular walker and wish to have this breed be your walking companion, they should be introduced to long walks gradually. They are not suitable as running companions because their legs are short and they tire easily. Because of their tendency to have respiratory ailments, they should not be exercised for long periods of time during hot weather, even if they are accustomed to exercise. These little guys are intelligent and eager to please their owners, once dominance is established. They can be willful, so it's important to establish yourself as the Alpha dog early on. Because the English Toy Spaniel can sometimes be timid with strangers, it's very important that they be socialized very early on to prevent them from being fearful of your family's visitors. If you are planning to show this breed, introducing them to the life of the show ring early will prevent them from being fearful of the events that will take place in the ring. If they are properly exposed to the ring, however, their naturally sunny personalities are sure to be favorite. Crate training works well for housebreaking this breed. Since they are so small, they can find many places in your home to go to the bathroom unnoticed, and once the habit is started it is very difficult to break. However, because of the dog's intolerance of extreme temperatures, many owners choose to paper train this breed, so that they are not required to go outside to go to the bathroom when it is very cold or very hot outside. This also works well for high rise apartment dwellers who don't want to make frequent trips outdoors. English Toy Spaniels are known for being difficult to leash train, so it's important to begin this task early and to be patient. They have a bit of a hunting instinct, and will usually chase after any bird around, so it's important that they not be left off their leads.